Captain Melanson demonstrates the tying of a knot. 20 ten and eleven year olds donned their new uniform, put on their name tags, and assumed their nicknames this morning as the first of what we hope to be an annual event started at the Crystal Beach fire station. The group of students were randomly selected from a large group of applicants who had applied for the academy at the end of the school year. Junior firefighters will be spending the next week with our Public Educators and Volunteer Firefighters learning what it is like to be a firefighter. Topics for the weeks will include hands on sessions of knot tying, fire safety, water safety, boat safety, first aid, and a visit from the Police. Canada, a physical fitness lesson, and then the day will continue with various fire safety initiatives. The goal of this week is to give the youth of Fort Erie a taste of what a firefighter does, and also to give them some very important life safety skills that can be used in the future. 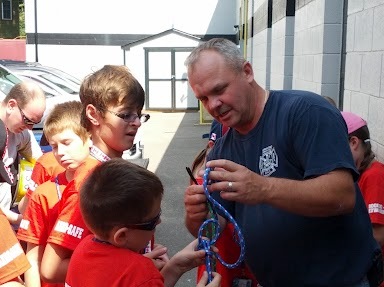 Students could be seen learning how to tie various knots that are used in the fire service, and applying this knowledge by securing various pieces of equipment, to be raised to the roof of the fire station by volunteer firefighters. The majority of the week will be hands on training, getting wet, dirty, and also having some fun. There is no cost to the students, with snacks, uniforms, and other supplies being supplied by local businesses and the Town. 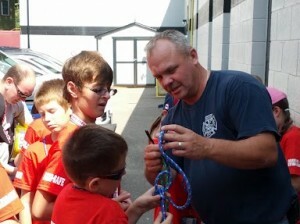 Photo: Captain Ed Melanson demonstrates the art of tying a figure 8 follow through knot to several eager learners. After the first day, we have received a lot of very positive feedback about the program.